Most sciatic pain is caused by trigger points in muscles. Sciatica is the most common lower body pain complaint that we see in our clinic. It is a description of radiating leg pain, not a diagnosis. Although most physicians and physical therapists will assume that it is caused by nerve entrapment in the lumbar spine (radiculopathy) or nerve entrapment by the piriformis muscle, we have found that most sciatic pain is caused purely by trigger points (taut muscle fibers) in the gluteal and quadratus lumborum muscles. Knee pain and ankle pain is also often due to trigger points in these hip and low back muscles. Sometimes the client feels the pain down the entire lateral or posterior leg. But sometimes only a portion of the sciatic pain distribution pattern is felt, in the knee or in the ankle. The following case study illustrates this. Complaint: Right leg pain. Lateral thigh, lateral knee, lateral ankle. Initial Assessments and Observations: Shortened, altered gait. Limited dorsiflexion. Stance phase brief on right leg. Lower crossed and upper crossed static posture (anterior pelvic tilt, excessive lumbar lordosis, head forward). Effective leg length difference 1/4″ high right. Both feet hyperpronation, right knee crepitus. No hemipelvis difference. 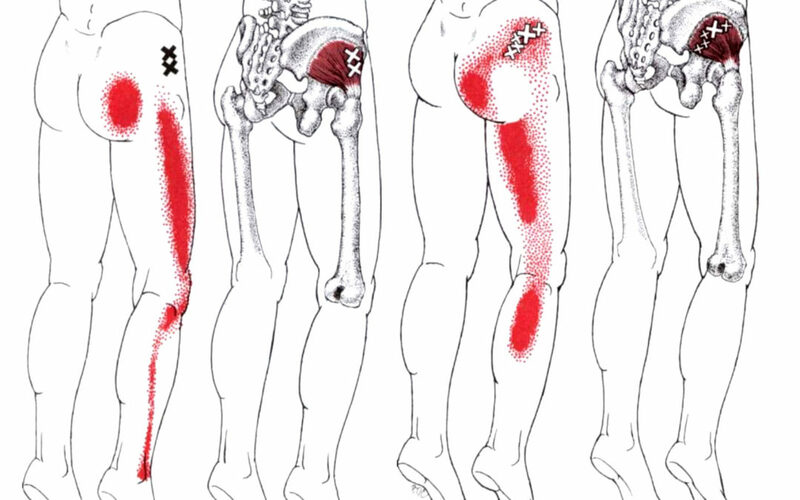 Treatment Design and Rationale: Based on the initial findings of effective leg length difference and foot hyperpronation, it was probable that her sciatic pain (in part or whole) was coming from trigger points in her gluteus minimus (with satellite referral from the other glutes and quadratus lumborum). Findings During Treatment: It was curious that she reported knee and ankle pain when sitting but did not have a hemipelvis difference. Usually pelvic asymmetry will cause trigger points in the quadratus lumborum to become irritated when the client is sitting, and generate sciatic pain. It was possible some aspect of her pain was lumbar radiculopathy, but I ruled that out when I discovered the pain when sitting was her gluteus maximus being compressed and triggering the sciatic pain referral. Self Care Recommendations: Posture control insoles to stabilize gait. 1/4″ heel lift in left shoe to level the hips during standing and walking. Compression and contract/relax stretching for gluteal muscles (minimus, medius maximus) and quadratus lumborum. Sitting upright at her desk at work so her gluteus maximus would not slip underneath the ischial tuberosity. Outcome: Client was pain-free after the first session. Sciatic pain started to come back 2 days post session. Client could reduce the pain with self care. Did two more bodywork sessions. Each time the client came in with less pain than the time before. I re-instructed her each session in the self-care therapy and made refinements to her techniques. The third session her husband came along to observe and learn compression techniques so he could assist her. After the third session she was confident she could remain pain free with self-care. When the client arrived at the studio I “buzzed her in” and then stood at the top of the stairs to welcome her. I greeted her and watched her come up the stairs. This is one of my cultivated habits, to evaluate functional movement and gait while the client is unaware. Her movement up the stairs was somewhat labored and she used her right arm on the hand rail not just for balance but to help pull herself up the stairs. When she walked into the treatment room I observed her from behind and her gait appeared altered. Her stance phase with the right leg was more brief than the left, like she was trying to keep weight off it. Her swing phase with each leg seemed shortened and her ankle dorsiflexion and plantar flexion were limited. She reported pain in her right lateral leg. During the interview she reported intermittent right lateral thigh pain, and right lateral knee and ankle pain. Movement seemed to help, but if she walked a lot she would feel lateral thigh pain, knee and ankle pain. From the initial assessments I postulated that her knee and ankle pain would have strong contribution from her glutes and QL. Her pain is on her right side, same side as her high illiac crest and strong foot hyperpronation. So her QL would habitually be short on the right side and her abducting gluteus minimus and medius fibers would have to work extra hard to stabilize her gait, leading to trigger points. We started in supine position. I checked the metatarsal-phalangeal joints of her foot and the second toe MTP joint was more distal than the big toe MTP joint, an unstable foot structure (Morton’s foot). I rotated her right ankle and movement was limited in all directions, her lower leg muscles were very dense, probably from having to provide extra stabilization. The vastus lateralis was tender in the mid belly region and also in the more distal oblique fibers that commonly cause lateral knee pain. I could have worked a lot on the quad muscles to treat the knee pain, and on the lower leg muscles including the peroneals to address the lateral ankle pain, but that would not bring lasting relief. The pain source was further upstream. Leg adduction stretch often reveals myogenic sciatica referral. Moving up to the hip, there were taut fibers in the TFL and anterior glute minimus but no referral pain on palpation. I had her abduct her leg, contracting the abducting glute fibers, then brought the leg into adduction to stretch those fibers. She reported a “stretch” in her VL. Her knee was straight and the VL was lax, so there was no stretch happening there. This happens a lot. The client reports a “stretch” along the lateral or posterior leg when the only fibers stretching are the glute minimus and medius muscles in the hip. This is sciatic pain referral from the glute minimus muscle. The client has sensation down the leg, and knows the leg is being moved, so perceives the sensation as a stretch. Satellite pain referral from gluteus maximus. I had her sit up and round forward so I could look at her spine. As soon as she rounded forward, flexing her spine, she felt pain in her right glute medius area and radiating down her lateral leg. It was possible there was radiculopathy at her lumbar spine when she flexed. As a test, I put her into supine position and lifted her legs, flexing her lumbar spine in the same manner. This time, no report of pain…What was the difference? There was no compression on her gluteus maximus in this supine position. I postulated that when she rounded forward when sitting, the belly of the glute max slipped under the sit bone and the taut fibers there were irritated by the compression. The glute max can refer pain into the glute minimus which then produces the sciatic leg pain. This is known as satellite referral. I put her into side position, palpated the glute max fibers that would slip under the sit bone when she was seated. When compressed, she reported her familiar lateral leg pain. Not radiculopathy – glute satellite referral! Specific taut fibers can generate specific distal pain. I proceeded to hunt down taut fibers in her right glute minimus, medius, max and QL. When compressed, all could generate the lateral sciatic leg pain. In her lateral superficial QL I found a particular fiber that would specifically generate only the lateral knee and ankle pain. I also found a specific glute medius fiber that would generate the same specific knee and ankle pain. This is a perfect example of satellite trigger point referral and the “cross referral” that happens between the QL and the glutes. It is also a good example of how a specific taut fiber can refer a distinct distal pain, not the whole sciatic pattern. After releasing the taut fibers with compression during passive movement and contract/relax stretching, the client had no active pain. I armed her with a lacrosse ball and taught her how to compress her glutes with it, and to get compression on her QL. I also taught her contract/relax stretching for QL and glutes. She has a desk job and is sitting a lot during the day, so I encouraged her to evaluate her posture, to sit upright so her sit bones are directly on the chair without compressing her glute max. And also to get up frequently and move. I saw her twice after the initial treatment. Each time she came to the studio with less initial pain and we got it to zero by the end of the session. Her husband came to the third session and I coached him in compression techniques so he could assist in his wife’s home treatment. By the end of the session they were confident they could eliminate the sciatica with what they had learned.